Margret Singleton Pringle the daughter of the late Gaines and Bettie Ford was born in Marion County, SC on April 11, 1923. Margaret gained her wings early Friday morning, August 31, 2018 at her home surrounded by her loving family. Margaret was the oldest of three children. One brother, Richard L. Ford, preceded her in death. 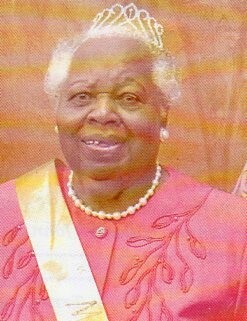 She attended Melvin School Mullins, SC and graduated in the Class of 1942 from Mullins Colored School, (now Palmetto School). Margaret accepted Christ at an early age and joined the St. Paul Baptist Church, where she served faithfully until her health began to decline. She was a diligent member of Sunday School Class No. 2, and the Mack T. Hines Bible Institute. Margaret’s greatest joy was serving on the St. Paul Nurse’s Guild where she was the president for over fifty years. She was the heart and soul of this ministry. She was a member of the Church Women United, serving as its treasurer. Margaret possessed a kind and loving spirit and always had a smile and an encouraging word for everyone she met. September 25,1954, she married the late retired MSG Crisco Pringle. As a military spouse, Margaret supported and traveled extensively with him as a homemaker. This union was blessed with three daughters. One daughter, Christal M. Pringle preceded her in death. Margaret showered her family and many others with an abundance of love and affection. Her doors, her heart and her arms were always open. Whenever you needed a comforting ear or a stern word of advice, she was there to oblige. Those left to cherish her life and her undying love include: her daughters, Jean S. Brunson and Regina (Norman) Floyd both of Mullins. One granddaughter, LaTonia (Alvin) Salters of Snellville, Ga. Five grandsons: Sean Brunson, Jamie Brunson, Mychal Legette, Derrell(Taneshia) Pringle, and Jonathan Pringle. Seven great grandchildren: Jenee’ Bell, Taliah Davis, Mychai Legette, Taylor Salters, Genesis Legette, Hailey Salters, and Derrell Pringle Jr. and one great-great granddaughter, Payton Bell. One brother, who devotedly cared for her, Willie F. Ford of the home. A dedicated neighbor and friend, Annie Jane Godfrey and Shavonne Davis and many nieces, nephews, family and friends.